Robert and Melanie Sachs run Diamond Way Ayurveda together in San Luis Obispo, CA. Robert is a Licensed Clinical Social Worker, massage therapist, yoga instructor, student Eastern spiritual and healing traditions. Melanie has been featured in numerous spa and health magazines and is a frequent presenter at healing and spa conferences worldwide. While they both are authors of their own books, they have drawn on their shared experience and co-authored Ayurvedic Spa which is a classic guide for spa owners and individuals interested in home spa techniques. We are so honored to have them with us. Enjoy this Shift…. Lindsay, Melanie and Bob talk about Ancient healing made New…. Melanie and Robert Sachs’ background is both conventional and “alternative”. Melanie was trained as an occupational therapist in England and Robert is a licensed social worker. Their interest in alternative approaches to health and healing began in the late 1970’s with their involvement in London’s macrobiotic community and Robert’s studies and teacher certification in hatha yoga with the Inner London Education Authority. Before they left the UK, they were also instrumental in the creation of the Growing Family Center at the East West Foundation in London. Having begun a long relationship with several Tibetan masters, Melanie and Robert returned to the United States to connect more closely with Tibetan Buddhist tradition in up state New York. From there, to deepen their studies in alternative approaches to health care, they moved and eventually settled in Lexington, Kentucky in the 80’s to work in one of the first holistic clinics in the US with one of the founding members of the American Holistic Medical Association, Dr. Walt Stoll. In 1984, Melanie met her first Ayurvedic teacher Dr. Vasant Lad and after Robert graduated with an M.A in Social Work the couple relocated to New Mexico to study Ayurveda where they were first students then writers. Robert’s second book combined his interest in Ayurveda and Tibetan medicine, the study of which had grown under his tutelage with Tibetan doctor, Lobsang Rapgay. Tibetan Ayurveda was published in 1995 with a second edition in 2001. It was the first time traditional Tibetan medicine had been presented in a western holistic framework. Melanie published her first book Ayurvedic Beauty Care in 1994. It is now considered a must for those seriously interested in natural and conscious body care. 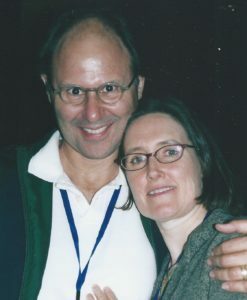 Since the late 90’s Melanie and Robert have worked together, creating Diamond Way Ayurveda, an educational and product company devoted to preserving and promoting both Indian and Tibetan body care techniques. Together they offer classes, design equipment and formulate spa products to support the ancient techniques they teach. In the fall of 2007 they published Ayurvedic Spa with Lotus Press, a work that is already considered a classic. Dr. Vasant Lad once commented that Melanie and Robert’s love for Ayurveda has been the inspiration behind their inventive and pioneering work. I would say that the path of creating our own business was organic. It had to do with how we live and how we thought we could best help others to live happier, healthier, and more inspired lives. What we have come to realize over time is that we are very community-oriented people with an eye on always trying to uplift those around us. There is a Buddhist saying that it is easier to put on shoes than to cover the world in leather. Wellness to me (Robert) is about resilience, acceptance, and creativity in handling the various curve balls that is life. A physician in my 20’s who told me that a lot more was going to go wrong with me over time. My initial response (Robert) was “Like hell…” Of course we do change, but I really feel that fear-based medicine and us having damaging stories about ourselves, our lives, our relationships is really the biggest problem in the sense of feeling well day to day. Diet, exercise, yoga, meditation – basic stuff that should be a part of civilizing. And beyond these a greater and greater level of self-acceptance. MIND precedes body. Develop critical thinking skills. Contemplate, meditate, read, and listen to others and a world that is always speaking to us. Melanie Sachs is recognized internationally as one of the foremost authorities for Ayurveda to the spa industry. She is featured in numerous spa and health magazines and is a frequent presenter at healing and spa conferences worldwide. Her book, Ayurvedic Beauty Care, is considered a must for those interested in natural and conscious body care. She is the co-author with her husband, Robert of Ayurvedic Spa which is a classic guide for spa owners and individuals interested in home spa techniques. Along with her primary teacher, Dr. Vasant Lad, Melanie has also studied with Drs. Shyam Singha, Sunil Joshi, Pankaj and Smeeta Naram, and Lobsang Rapgay. Robert Sachs is a Licensed Clinical Social Worker, a licensed massage therapist, yoga instructor, and has been a student of Indian and Tibetan spiritual and healing traditions since the early seventies. With his wife, Melanie, Robert runs Diamond Way Ayurveda, the foremost promoters of Ayurveda in the spa and beauty industries. Along with their release, Ayurvedic Spa, Robert is the author of Nine Star Ki: Your Astrological Companion to Feng Shui, Tibetan Ayurveda: Health Secrets From The Roof of The World, Perfect Endings: A Conscious Approach to Dying and Death, The Passionate Buddha: Wisdom on Intimacy and Enduring Love, Becoming Buddha: Awakening the Wisdom and Compassion to Change Your World, The Wisdom of The Buddhist Masters: Common and Uncommon Sense, and Rebirth Into Pure Land: A True Story of Birth, Death, and Transformation &amp; How We Can Prepare for The Most Amazing Journey of Our Lives.